First of all, what is a disconnected logon? A Disconnected Log On is when the system generates a message that is telling you that the screen or feature that you are trying to access is in use, however the user specified in the error message is not using that screen or feature. Disconnected logins occur when users are forced out of the system or the system has been closed in an uncontrolled way part way through a session. I.e. through Windows Task Manager and ‘End Task’. How does this affect you? A user of the Sage 200 system? 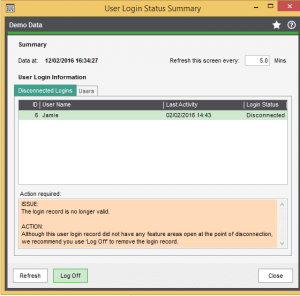 The simple disconnected logon can create quite a hassle to you the user of Sage 200. It can restrict you from entering into certain forms within the system and/ or restrict you from completing important necessary processes i.e. Period End or Year End routines. And this will continue to be a restriction until the Disconnected logon has been logged off. What these errors may look like? How do we get rid of a disconnected logon? – In here you will see a list of users. As good practice we would just highlight all the users, and log them all off. This will only clear out all sessions that have not been exited correctly, it will not log anybody off Sage. Don’t Panic! You may find from time to time that you will get all types of error messages appearing on your screen, and that although at the time you may think that it is a ‘huge’ problem, more often than not, it is something very simple that can be resolved quickly, if you feel confident enough to tackle this yourself, we do have a large Library of Guides and Blogs for you to use or if you are struggling, just remember we are only a call away, and keen to help you, so don’t hesitate, give us a call. I hope that you have enjoyed reading my blog, and hopefully it will help you when come across this type of error message. If in doubt, give us a call, we are always happy to help! We’d love to hear any of your feedback in regards to the reports or the guides on our website and welcome any thoughts or ideas that you may have for future content, or if there is a particular area that you feel we are lacking, please feel free to send us an email to info@itas.org.uk and we’ll see what we can do!